Kuih Kosui, or otherwise known to the Peranakans in Baba Malay as Kueh Ko Swee also go by another name which had been forgotten by many, Kueh Hamba which literally means “slave cake”, according to Wee Eng Hwa in her cookbook “Cooking For The President”. Intriguing name definitely… and I often wonder why. Do let me know if you have the answers to the origins of this steamed cake or its name. Nonetheless, it celebrates the use of coconut sugar and is surely a favorite amongst gula melaka lovers like me. Though I love the “Cooking For The President” cookbook, I’d not tried the Kueh Ko Swee recipe in there. Instead, I fall back on a tried and tested recipe which I’d made and replicated many times, whenever I have a craving. I’d also made modifications to the original recipe in accordance to what I learnt about this kueh over the years. But the “backbone recipe” comes from Cik Rohani Jelani’s “Malaysian Cakes & Desserts” from the “Periplus Mini Cookbooks” series. My copy dates back to 2001 when the residential telephone numbers in Singapore still followed a seven-number system, without the “6” in front. It has since served me well, helping me recreate many wonderful Malay-influenced kuih muih which many of us grew up eating. Going for less than SGD 5 then, it must also be one of the cheapest cookbooks I have on my bookshelves. Nonetheless, it is also one of the most “dependable” books I often refer to whenever I need ideas. It has since been reprinted many many times and still available at the bookstores. I understand that it is now slightly over SGD 6 a copy but still remains very affordable. If you don’t have a copy of Cik Rohani Jelani’s “Malaysian Cakes & Desserts” on your bookshelves, I highly recommend you to get one. 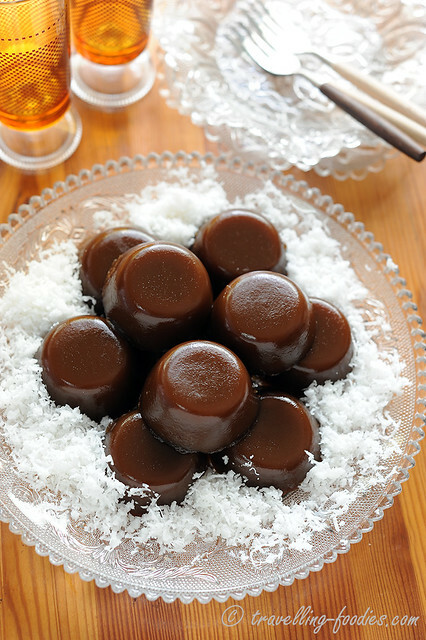 Traditionally, kuih kosui is made with homemade “air abu“. This is done by sunning and drying durian husks before setting them on fire on a hot and sunny day. The ash and cinder is then collected and added into water. The mixture is left to stand for the ash to settle and the “ash water” carefully decanted and stored for future use. I wonder if anyone still does this the traditional way, let alone remember how it was done in the past. If teacups are not available, individual servings of kueh kosui can also be made using muffin pans. Otherwise, the batter can also be steamed as a whole cake in a brownie pan. I’d used those round aluminium pans for steaming Chinese Orh Kueh (steamed taro cake) before for making kuih kosui before and they work equally well. The steaming time has to be prolonged around 30-40 min, again under very low heat. The final kuih kosui should have a really deep brown hue, marked by the sweet and lovely aroma from palm sugar. This is a test to the quality of gula melaka used. The kueh should have a glossy finish with a slightly translucent appeal and a very affirmative taste of alkaline water. 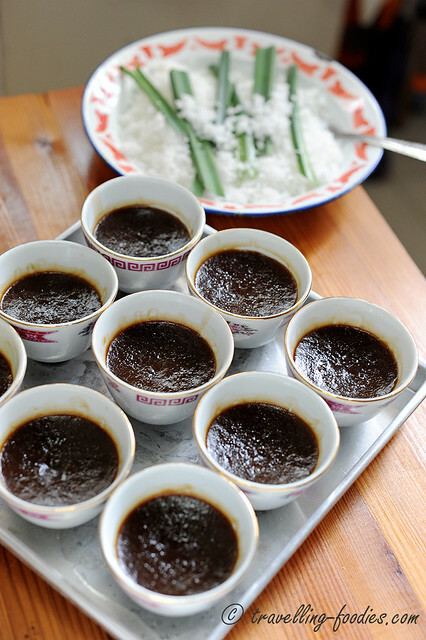 Wee Eng Hwa’s recipe calls for brown liquid colouring which some have replicated her recipe using treacle. I found this to be totally redundant and unnecessary, as long as good quality gula melaka is used. 1. First start by preparing gula melaka syrup. To a heavy pot or saucepan, add gula melaka, granulated sugar, knotted pandan leaves and 100 ml water. Heat with lid on until the gula melaka has almost melted. 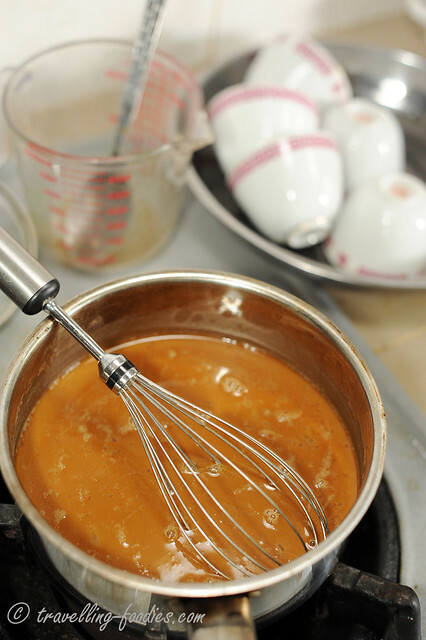 Turn off heat and stir to allow the remaining gula melaka to melt with the residual heat to form a thick syrup. 2. 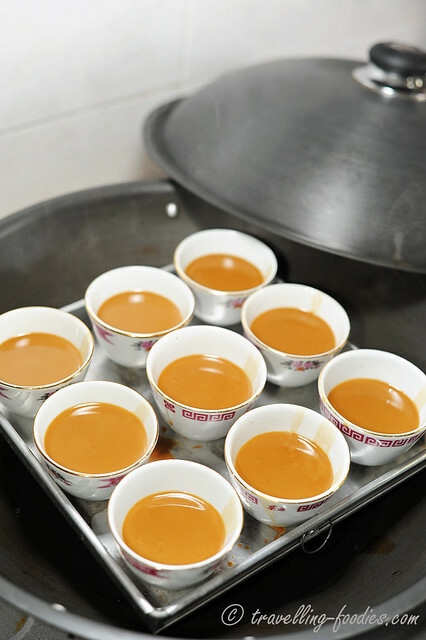 While waiting for the syrup to cool slightly, prepare the tea cups for steaming. A muffin pan can also be used. Prepare a wok of boiling water and arrange the teacups or muffin pan onto a steamer or steaming rack. Steam for 5 min. 3. While waiting for the cups or mould to steam, prepare the kuih kosui batter. To a measuring cup with capacity of at least 500ml, add 100ml of water. Strain gula melaka syrup through a fine wire sieve into the water and top up with more water to yield a the final volume to 500 ml of diluted syrup. 4. Pour syrup into a a mixing bowl. Add rice flour, tapioca flour and alkaline water. Mix evenly and strain the mixture over the saucepan or pot to remove any flour lumps. 5. Return the saucepan to the stove and over very low flame, heat the mixture until it begins to thicken slightly. Use a wooden spoon or heat resistant spatula to mix the batter at all times, especially taking care to scrape the bottom, sides and corners of the saucepan to make sure that the batter doesn’t start to cook and harden there. 6. Give the batter a quick stir to homogenise the flour and syrup mixture before pouring over tea cups or moulds until three-quarters full. Steam for about 15 min under very low heat or until the batter turned a dark brown and has completely set. The water beneath the steamer should be barely simmering. Remove from steamer and set aside to cool. 7. While waiting for the teacups to cool down, prepare the grated coconut. 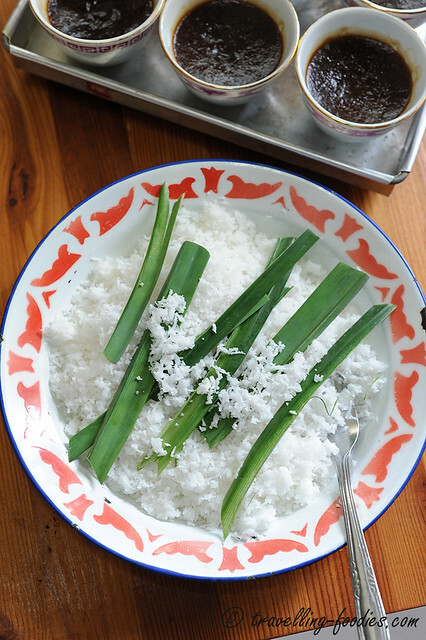 Place grated coconut and pandan leaves in a shallow dish and sprinkle a pinch of salt. Give the mixture a good toss and steam for 10 min. This process cooks the grated coconut preventing them from going rancid too quickly. The pandan leaves can be shredded or torn lengthwise into narrower strips to help release more aroma. 8. 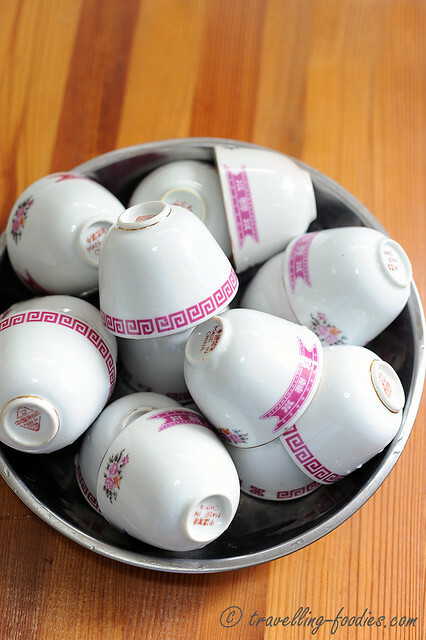 When the kuih kosui has cooled down, remove from teacup moulds by running the sides carefully with a small knife or tooth pick. Roll over grated coconut and serve immediately. This entry was posted on July 22, 2013 by Alan (travellingfoodies). It was filed under Food, Simple Eats and was tagged with air abu, alkaline water, coconut, grated coconut, gula melaka, kueh, kueh kosui, kueh koswee, kuih, kuih kosui, kuih muih, lye water, malay, Nonya, Nyonya, Peranakan, rice flour, straits chinese, tapioca flour. Kuih kosui is one of my favourite snacks but I had not been able to get it right. Hope I’ll be able to try your recipe one day! Yours look really good! Hi Alan, I have tried this recipe…absolutely delicious and thanks for sharing the low heat steaming method. The kuih came out beautiful. Thanks! what is gula melaka?thanks and more power! 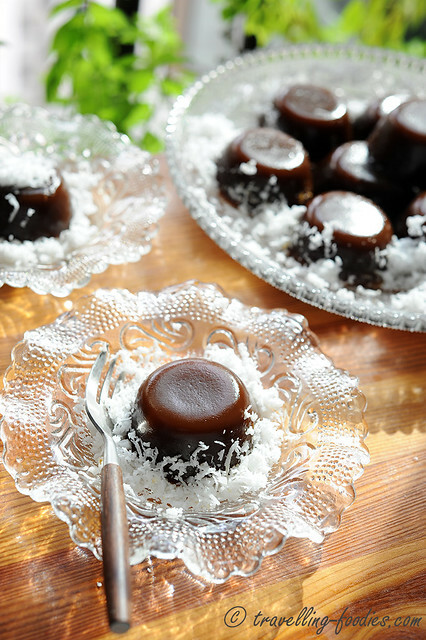 Hi Edna, Gula melaka is a type of unrefined sugar which is extract from the sap coconut buds. It is very similar to jaggery but has a very characteristic aroma and taste. You can try to get it from Asian grocers and may go by the name “coconut sugar”. You can also try looking for the names “gula jawa” and “palm sugar”. Hi Alan, can I ask if the tea cups need to be brushed with oil before steaming so that it is easier to remove later? No no. Not at all. Just steam them for 5-10 min before pouring the batter. Remember to steam the kueh kosui with barely simmering water to get a nice glossy finish. If not the kueh would appear pockmarked! Love the deep brown hue. Do u use gula melaka from Malacca or Indonesia? 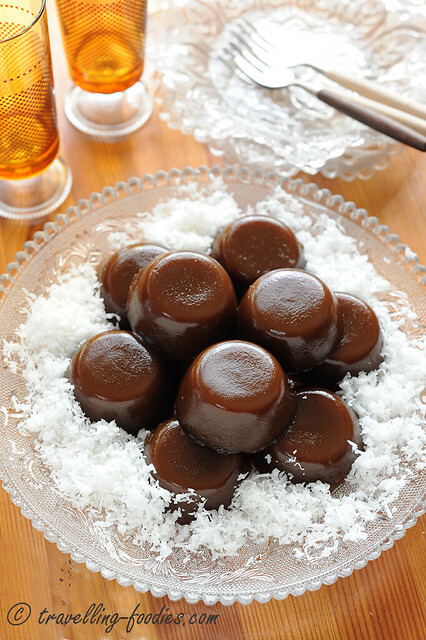 Does this recipe yield a texture that’s slightly wobbly, not too firm (which I feel would be the ideal kuih kosui texture)? Thanks!